고아, 인도의 로드하우스 호스텔 | 호스텔월드에서 예약하세요. All bookings made through the website are confirmed, subject to any conditions highlighted during the booking process. Changes to bookings cannot be made through the website. To make booking changes or cancellations, contact Roadhouse Hostels at +91 7715051126 or goa@roadhousehostels.com. •	More than 7 days in advance of arrival time: deposit forfeited; no additional charges. •	Within 24 hours of arrival time: equivalent to the cost of one night’s stay. •	No cancellation received: equivalent to a maximum of two nights’ stay. •	Group bookings with two or more weeks’ advance notice: Deposit refunded in full. •	Group bookings with less than two weeks’ notice: entire deposit forfeited. For the purpose of calculating cancellation charges, arrival time at the hostel is considered 18:00hrs (6 pm) local time. This applies to cancellations only, not too late arrivals. All cancellation charges are made by the hostel to the same credit card number provided during booking. New arrivals can check into their rooms after 2 pm each day. Guests may arrive earlier and leave their luggage at the hostel but access to rooms will not be granted until after 2 pm. Departing guests must remove all their belongings from their room, and check out before 10 am. After this time guests may make use of the luggage storage facilities but all possessions must be removed from the room and the keys handed back to reception. Photo identification is required upon check in, preferably a Passport, I.D. card or driving license. Reception timings are 9 AM-10 PM. Please inform us in advance for early or late check-in so that we can make the necessary arrangements for your arrival. Check out is at 10 am and guests must hand all keys back to reception. Bookings cannot be accepted from any person under the age of 18 unless they are accompanied by an adult (over 18). Under 18 years are only permitted in a private room with parent or guardian and not in dorm rooms. Unlike some hostels, we do not have an upper age limit. Most of our guests are backpackers in the 18 to 30 age range. Please be aware that you may be assigned a top bunk! The comfort, safety and security of our guests are of paramount importance to Roadhouse Hostels. Any guest(s) who, in the opinion of our staff, compromise the comfort, safety or security of other guests, staff or local residents will be requested to leave the hostel premises and will not be offered a refund. Guests are expected to respect other guests, staff, local residents and property. In the case of groups, the group leaders must ensure that all members of their group behave in an acceptable manner. Failure of any individual group member to do so will result in the expulsion of the whole group. 6. Smoking: Smoking is not permitted anywhere within the building. Any guest found smoking within the building will be asked to leave the premises immediately and will not be offered a refund. A smoking area and ashtrays are provided outside the building for guests who wish to smoke. 7. Drugs: Roadhouse Hostels have Zero tolerance policy regarding the use of illegal drugs. 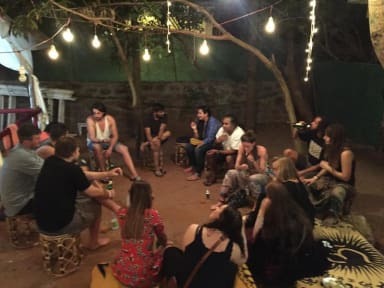 Any guest found using drugs within the premises will be asked to leave Roadhouse Hostels and the competent authority will be informed immediately. No refund will be given in such circumstance. 8. Personal Property: Guests may use secure lockers, however, it remains the guest&#39;s responsibility to ensure that their personal belongings are secure at all times. Roadhouse Hostels accepts no liability for the loss, theft or damage to property however sustained or caused. Please bring a padlock to use with your locker. 9. Roadhouse Hostels Property: Guests will be expected to reimburse Roadhouse Hostels for any damages caused by inappropriate behaviour during their stay at Roadhouse Hostels. 10. Liability: Except in relation to death or personal injury caused by our negligence Roadhouse Hostels liability remains, at all times, limited to the value of the services booked, excluding any amendment charges paid to us. 11. Your Information: Roadhouse Hostels shall only store and use the information you supply to us or which is supplied to us for the purposes of carrying out our contract with you and to inform you of other services and offers which we make available from time to time. If you do not wish to receive such information please let us know by emailing us at goa@roadhousehostels.com or by writing to us at Roadhouse Hostels, 954 Grande Peddem, Next to German Bakery, Anjuna, Goa 403509 (India). 12. Errors and Omissions: Any omission or error in sales literature, web pages or site, order form, quotation, price list, order acknowledgement, despatch note, invoice or other document issued by us may be corrected by us without liability. We will advise you of any changes at the time of booking or as soon as is possible thereafter. 13. Discretion: All bookings are subject to availability and Roadhouse Hostels reserves the right to decline any booking at its discretion. 14. No Show: If you have not notified Roadhouse Hostels of a cancellation at least 7 days in advance of your arrival date, Roadhouse Hostels reserves the right to charge your credit card the total outstanding amount for the entire stay booked. All bookings made through the website are confirmed, subject to any conditions highlighted during the booking process. Changes to bookings cannot be made through the website. To make booking changes or cancellations, contact Roadhouse Hostels at +91 832 6525552 or goa@roadhousehostels.com. 16. Late departure: In the case of a late departure, Roadhouse Hostels reserves the right to charge for a further night stay at the appropriate rack rate of the bed(s). Management discretion will apply. We cannot guarantee that if you book two or more guests at the same time that we are able to accommodate you all in the one dorm room. We will endeavour to place your together but this depends on the beds being available. 로드 하우스 호스텔은 고아의 안주 지역에있는 유일한 호스텔입니다. 그 히피 문화, 해변, 좋은 카페, 벼룩 시장으로 유명한 그것은 긴 휴일을 보내고 찾는 사람들을위한 완벽한 장소입니다. 숙소는 혼합 기숙사와 성별을 바탕으로 기숙사를 제공합니다. 각 기숙사에는 전용 욕실, 이층 침대와 사물함이있다. 당신은 에어컨과 비 에어컨 기숙사를 선택할 수 있습니다. 호스텔은 또한 주문 아침 식사, 요리 시설, TV, 게임, 여행 서비스, 팁, 맑은 고아 날씨를 즐길 수있는 큰 정원, 무료 Wi-Fi를 제공합니다.